SC attracts an exclusive group of scientists, researchers, department managers, lab directors and decision makers from all corners of the High Performance Computing (HPC) and networking industry. Your organization can be well positioned and highly visible for the 10,000* attendees from around the world as they converge on Seattle, Washington to see the latest innovations in HPC, networking, storage, and related fields. No other event provides such extensive, targeted opportunities for exposure and in-depth interaction with your key customer audiences. The SC exhibit floor is a featured part of this premier and well-respected technical conference. Supported by a powerful live network infrastructure called SCinet, SC uniquely provides exhibitors the ability to showcase the full capabilities of your products and services for either large-scale or one-on-one demonstrations for prospective customers. As the venue that has built a legacy for debuting the most advanced innovations in the HPC, networking, and storage industries, attendees year after year come to SC to discover the latest solutions that will keep them at the leading-edge of their professions. *based on previous conference attendee numbers. All demographics were derived from a survey of SC09 registrants conducted by a third-party organization, Exhibit Surveys, Inc. of Red Bank, New Jersey. 53% of attendees come from organizations with 1,000+ employees. In 2009, nearly three quarters (74%) of attendees reported that they found new companies to do business with on the SC exhibit floor. Each year, SC builds and delivers the the most powerful network on the planet to the exhibit floor. Designed and built entirely by volunteers from universities, government, and industry, SCinet combines leading-edge hardware and high-speed wide-area communication links, providing unsurpassed connectivity to national and international networks. In its seventh year, this real-time information source allows attendees to obtain up-to-the-minute information about presentations/demonstrations on the show floor, as well as the technical program. Exhibits-related data feeds include exhibitor information, booth demonstration schedules, exhibitor forum presentations, and news about special events. SCinfo accounts are available free of charge to every exhibitor and attendee. The SC exhibit floor balances corporate exhibits with a showcase for innovative applications of high performance computing, networking, and storage from research institutions  universities, national laboratories, and nonprofit research centers  on five continents. These scientists and engineers display the latest advances in computational modeling, imaging, visual analysis, and data technologies, often partnering with industry exhibitors to showcase how particular products can achieve new research discoveries. Industry exhibitors have a special opportunity to present their R&D breakthroughs in our popular Exhibitor Forum series. This showcase is one of the unique features of SC, giving attendees access to the latest technology advances from industry exhibitors in all high-performance related disciplines. Participate in SC11s Exclusive Marketing Opportunities to increase your exposure and reinforce your sales message long after SC11 is over! SC11 hosts and promotes the largest, most comprehensive online resource for organizations in the high performance technology industry: the SC11 exhibitor list. The search engine allows visitors to search by product, category or keyword and find exactly what they want. Your listing on the web site is FREE when you participate as an exhibitor. Generate pre- and post-show promotion by utilizing the exclusive SC11 registration lists for promotional mailings. Customize your list by analyzing the detailed demographic information collected from each registrant. Using the pre-registration list ensures that your message will reach the target audience that is interested in your products and services. An essential guide distributed during SC11 and used as a year-round reference, The SC Exhibit Directory is a directory of events and the industry's reference guide to all the leading hardware and software exhibitors. 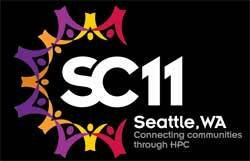 SC11 will provide you with the opportunity to invite your most valued customers and prospects to visit you at SC11. SC11's media headquarters will be a meeting point for editors and reporters from all the trade publications. An active media room provides you with on-site space for one on one media interviews as well as a distribution point for exhibitor media kits. Pre-registered media lists will also be available exclusively to exhibitors. Exhibitors profit from exposure in year-round attendance promotions that target the most active buyers. SC11 awareness and attendance is built through an extensive promotional plan that reaches hundreds of thousands of high performance technology professionals worldwide. A direct-mail and e-mail campaign distributes conference information and exhibitor lists, and thousands of complimentary invitations will be sent by exhibitors. Special editorial coverage in industry and related publications describing the size and scope of the SC11 Conference program. Seattle is sparkling with pristine spring water, mountains, vast forests and the endless ideas of curious minds. In Seattle technology and nature have achieved symbiosis: directing, inspiring, preserving and enriching both aspects of life to create an Emerald City. Not only does Seattle provide a perfect setting for SC11 and the work that will be done there, it offers a vast array of choices for entertainment, learning and renewal outside the event. Recently, readers of Travel + Leisure and Condé Nast Traveler, two of the world's foremost travel magazines, voted Seattle one of their top ten favorite cities to visit. From the Space Needle and the Experience Music Project/Science Fiction Museum to the Pike Place Market to kayaking with the orcas or a ferry ride to a quiet island, every interest can be satisfied.